The country's biggest companies are promising a recycling revolution. 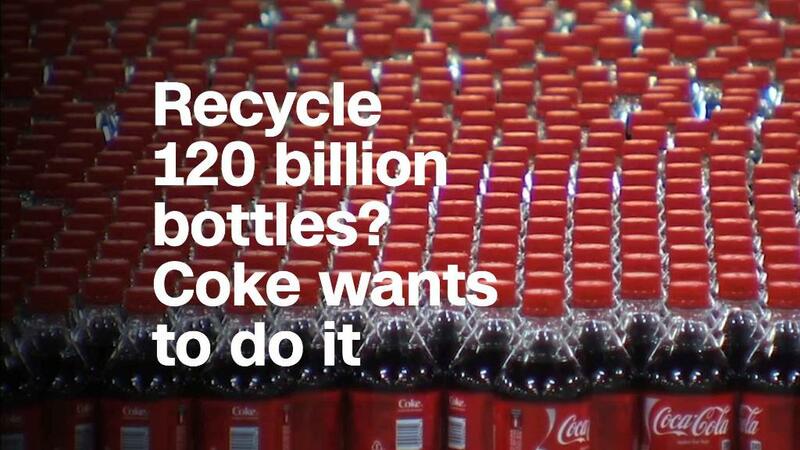 Coca-Cola (KO) said in January that by 2030, it will collect and recycle one bottle or can for each one it sells. Dunkin' Donuts (DNKN) said it will try to stop using foam cups by 2020. Several others, including McDonald's (MCD) and Procter & Gamble (PG), have made their own ambitious commitments to use sustainable packaging. But even the most sweeping efforts won't do much good without the help of customers, local governments and most importantly, competitors. Recycled materials aren't always cheaper than raw materials, she said, but their prices are consistent. "The volatility of the raw materials market is probably only going to continue to grow," she said. If companies invest in their supply chain now, they won't have to deal with volatility down the line — especially if oil prices continue to swing and global trade tensions continue to rise. There are other advantages to going green. Kevin Wilhelm, who runs a sustainability consulting firm, said that companies typically make recycling pledges because they've found that waste hurts their bottom line. And public commitments to sustainability are a good way to signal a company's values to employees and customers. But for now, said Croke, too many bottlenecks exist for "the economics of recycling [to] work on their own." "The US recycling system feels universal," said Keefe Harrison, CEO of The Recycling Partnership, a nonprofit group that uses corporate funding to help develop recycling infrastructure. "The truth is only half of Americans can." Harrison said that 22 million tons of recyclable materials end up being collected as trash because people don't have access to recycling. And not everyone who can recycle does. People might not recycle because it's easier to dump an empty container in the trash or simply because they don't care. But they also might not recycle because it can be complicated. "Consumer education is huge," said Wilhelm. He said that even he is confused when trying to recycle in new places. "When I travel and I go into a different city or state, I often times see myself standing over a bin and wondering what goes where." Ultimately, companies that switch to recyclable packaging "don't control or have any ownership over the system that recovers their material," said Croke. "Having more competitors at the table has not made it harder, it's made it easier," said Harrison. "They know they need to tackle large sustainability challenges collaboratively." "Smart companies," she said, are trying to figure out, "'What are the disruptive collective actions we can take to make the most out of our resources?'" "A really forward-thinking company would prove out the business case," for recycling, "and then lobby for it," said Bethany Patten, a senior associate director and lecturer in MIT Sloan School of Management's Sustainability Initiative. "Partnerships are essential to really make progress," said Bruce Karas, vice president of sustainability for Coca-Cola North America. "On recycling, it's going to have to be a collaborative effort." Karas added that his peers at other companies "have the same headaches" when it comes to figuring out recycling solutions. "There's always some opportunity to do some pre-comeptiteve work," he said. "It benefits us all."